Ten years ago, Steve Jobs announced the App Store. While its first titles were mostly games and novelties, soon major businesses began to recognize the power of mobile apps, shifting major investment from desktop PCs and web apps into iOS. 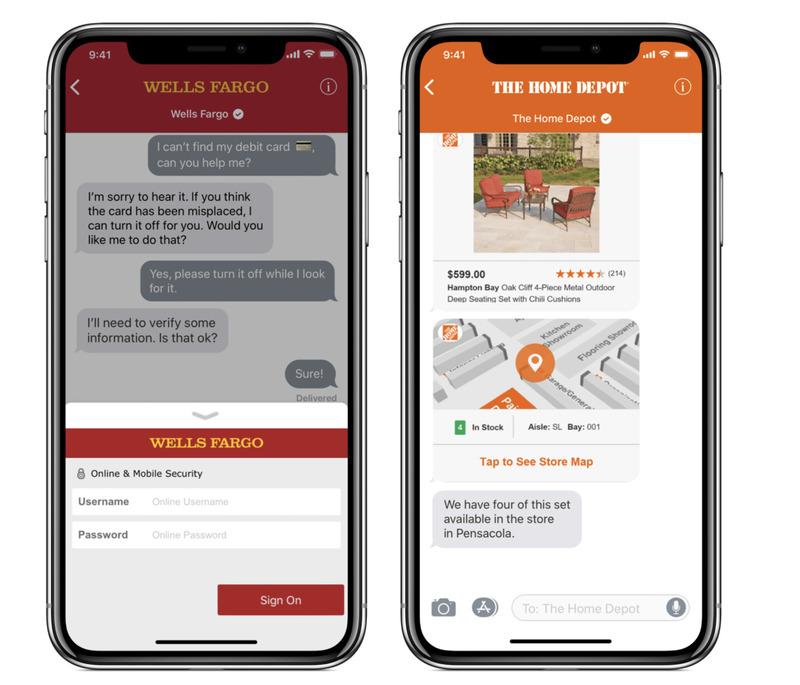 This year, Apple is inciting new enterprise investment in iMessage Apps with Apple Business Chat--billed as an interactive, personal way to connect with customers while respecting their privacy. Apple Business Chat enables customers to contact companies for personalized support using the familiar iMessage app. Just like personal chats, a user can initiate a conversation on their iPhone and resume the discussion on their Mac, iPad or even Apple Watch. They can get notifications when there's a response and can communicate in rich detail, such as sending a photo or other attachment. Unlike a phone conversation, users don't have to wait on hold or navigate through a voice-first bot conversation. Unlike the web, users don't have to search their way through a company's marketing or support forums to just find an answer or get help with an order. Business Chat also puts an emphasis on privacy: users don't have to log in via Facebook to share a huge profile that includes everyone they know, their political orientation and all their other personal details; nor do they surrender contact information that signs them up for tons of future, unsolicited offers and spam. One of the more interesting things about Apple Business Chat is that it involves a custom development platform. Leveraging the work delivered in iOS 10 for iMessage Apps, Apple enables companies to build interactive features that can present a choice (such as selecting a product or scheduling an appointment) or handle an Apple Pay transaction. Some critics scoffed at iMessage Apps when Apple announced the platform with the release of iOS 10. But for the enterprise, Apple's new chat messaging platform allows them to easily build dynamic ways to interact with their clients (such logging into an account, or performing some other task that is easier to do in software than it is to explain in words or communicate by voice; Apple's initial example was an app for airline seat selection) using the same iOS development tools they already use to create client-facing or internal apps for iPhone, iPad and Apple Watch. While Apple Business Chat can also be used in Messages on a Mac, there is no support in macOS for iMessage Apps (which are generally iOS app extensions). That may change if Apple incorporates the ability to execute iOS code on Macs (as it is expected to soon enable). Apple likes custom third-party development for its hardware because it builds a valuable ecosystem that makes its products more attractive (think Photoshop on the Mac, or Instagram on iOS). By owning and managing the development platform, Apple can also shape users' experience. In the early days of the Macintosh, that allowed Apple to introduce a revolutionary leap in software sophistication with its Human User Interface Guidelines that made Mac applications consistent, intuitive and easy to learn. When it introduced iPhone, its new iOS platform similarly reshaped how apps appeared and behaved to enable Apple to deliver another radical leap in mobile computing. Apple's initial value-add for the Mac platform was ease of use and graphical aesthetics. More recently, Apple has focused on graphical performance (the buttery smooth animations of OS X and iOS) as well as data security and privacy (turning on encryption default and limiting ad tracking and third party access to your personal data) in a world of malware and surveillance advertising. 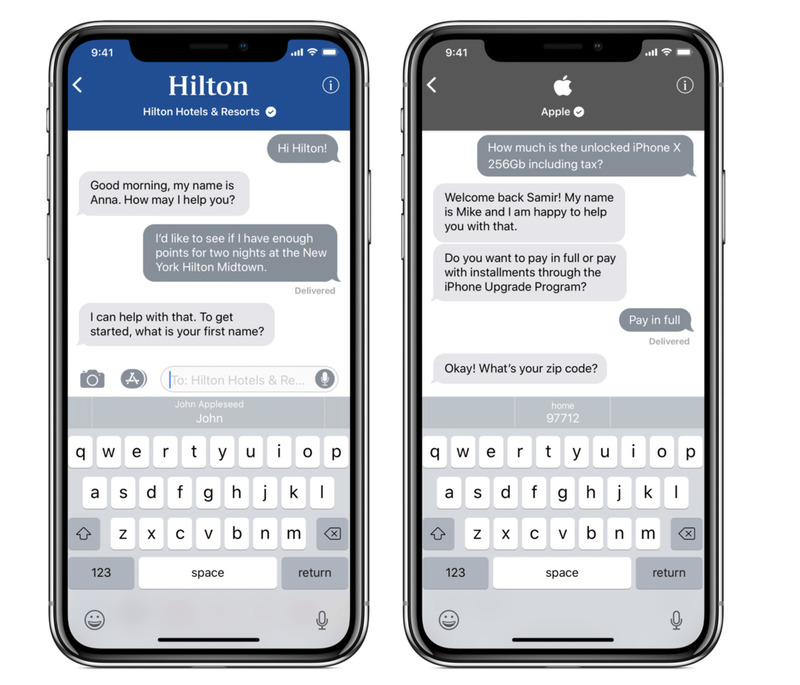 Apple Business Chat leverages companies' existing customer support infrastructure (their internal customer contact centers and the Customer Service Platform they already use) and integrates these with its own iMessage platform. It doesn't require companies to radically change how they provide customer support, but instead enhances their customer interactions with a design that's easy to use, efficient, secure and designed with privacy in mind. Consider the difference in Google's approach to messaging, which began with trying to inject ad messages into email, then trampled user's data privacy with Buzz, then introduced a complex communications platform with Wave that it expected everyone to learn, then attempted to copy Apple's simplicity and appearance with Allo without the same interest in privacy or encryption (because it wanted to read users' messages). Apple's success with iMessage adoption stands in stark contrast to Google's various stabs at communication initiatives. Apple's iMessage is designed as a product seeking to be attractive, valuable and useful to its audience. Google's efforts were all attempts to create a product for itself which it could use to monetize users. A similar contrast can be seen between Apple Pay and Google Wallet; Google hoped to push banks out of the way to establish itself as the account for users' transactions. Apple's approach was to work with banks to offer a secure, private way of making payments using the accounts individuals' already had. 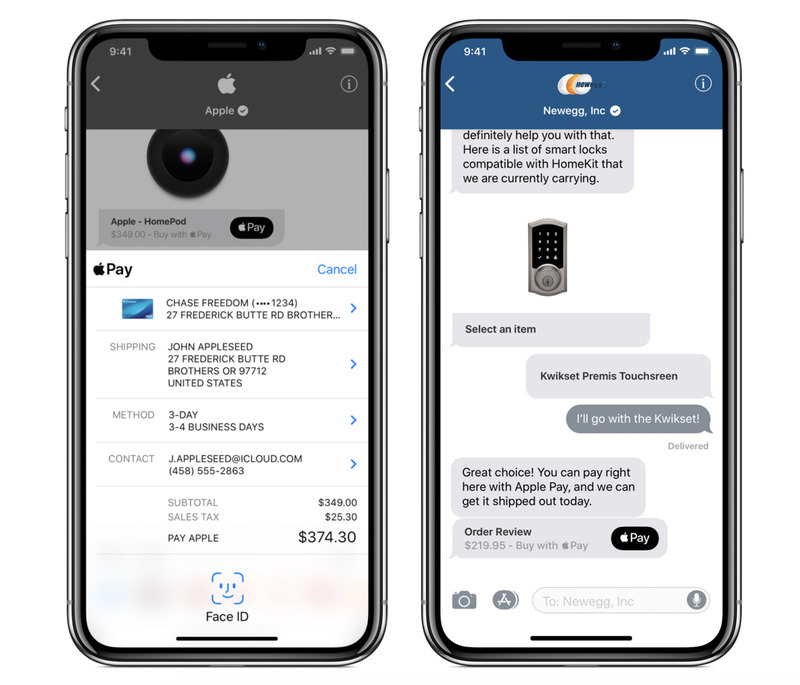 Apple Business Chat takes a very similar approach to Apple Pay, requiring minimal changes from companies while adding value to the interface they present to their customers. And it integrates with Apple Pay to enable seamless, secure transactions right within a support session. Apple is already working with a series of major Customer Service Platforms, including previously announced partners LivePerson, Salesforce, Nuance and Genesys, and more recently adding InTheChat and Zendesk. By leveraging the support of CSPs, Apple can launch its vision for enhancing how customers get support much more easily than if it were trying to build out a competing business outside of its core competency. Support from those partners is being expressed in the same way iOS developers talk about the App Store in glowing terms. 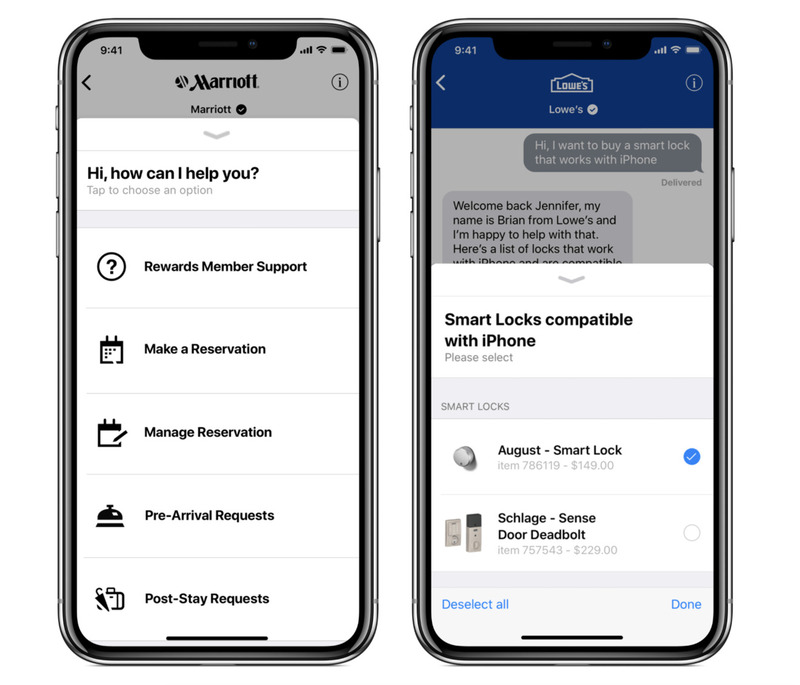 Salesforce pitches its LiveMessage CSP service to businesses as a way to "delight your customers at a fraction of the cost of voice support" on its website, which highlights its partnership with Marriott using Apple Business Chat. Meredith Flynn-Ripley, VP of Messaging at Salesforce, noted that, "Consumers today are five times more likely to message with family and friends than call them--and they expect to communicate with brands the same way." Flynn-Ripley added, "Salesforce is the leader in delivering conversational messaging within the world's number one Service platform and we consistently hear from our customers that they want to connect with their customers in new ways. We're thrilled to add support for Apple Business Chat to Service Cloud and provide new, easier ways for our customers to bring messaging directly into their CRM." Robert LoCascio, the founder and CEO of LivePerson (which handles integration for Discover, Lowe's and Home Depot) offered the statement, "What we're seeing is a tremendous shift to conversational experiences, and it's top of mind for many CMOs." Genesys highlighted a report by Garner which claimed that, "by 2019, requests for customer support through consumer messaging apps will exceed requests for customer support through social media." Apple Business Chat integration with Nuance--the original technology partner behind the launch of Siri--highlights the combination of "live agent" bots and live chats with humans that companies can use to handle incoming chat requests from customers. Nuance calls its virtual assistant "Nina," as describes it as "designed to deliver an intuitive, automated experience by engaging customers in natural, human-like conversations for a more efficient contact center operation." If a customer needs more help than Nina can provide, the chat can be routed to a real person. That's an approach Facebook attempted with its failed M general-purpose chat-bot, until it realized that it could not actually handle the range and depth of the wide-open questions it was getting with purely automated systems. Apple's Siri similarly conveys (problematically) that it can answer anything users can ask, making it easy to disappoint users who have complex tasks they want to speak out to a computer, only to realize that there are constraints on what can be expected of such a system. Apple Business Chat greatly narrows down what a person will be asking and then directs those questions to a specific company, making it much easier to handle incoming tasks and, if necessary, elevate complex questions to a person who is already familiar with handing that nature of requests for the company. It can even start the conversation with interactive, web-like navigation to further narrow down what a user wants to do. Currently, if you ask Siri a question about TD Ameritrade or Marriott, you get a dumb response that's not much more useful than a Magic 8 ball. In the future, Siri could connect with known Apple Business Chat partners to initiate a conversation that's handed off to an expert. While Apple's current state of Siri is frustrating enough to avoid using for anything but the simplest of requests, the plumbing Apple Business Chat is building out could provide an ecosystem of customer support partners that dramatically increase the value of Siri without being confined to voice-only conversations. A verbalized request to Siri--followed up by a combination of text or voice chat through Apple Business Chat, augmented with the interactivity of iMessage Apps that can tap into your calendar, send you to Maps, recommend an App download or set up an order with Apple Pay--offers a picture of the future of smart communications that Apple is building for its customers. It's a lot more realistic than the wide-open promise of Siri by itself, or the premise of voice-first ambient computing in general. Apple has some advantages to build upon with Siri, including its support for a broad number of languages, an intent to build security and privacy right into the design, an ability to go beyond just voice interactions, and deep integration with the devices people already broadly use: iPhones, Car Play and Apple Watch. Expect to hear more about the future of Siri, iMessage Apps and Apple Business Chat at WWDC18.